In spite of everything, you can't always tweak an image to match what you originally visualized. This shot, taken with a point and shoot camera, was meant only as a record of a precious moment in time, when two grandchildren put into pictures the love they felt for their grandfather. I am beginning the "dig out" from under an accumulation of the by-products of the my parent's lives. Now, as I start to accept, but never embrace, my life as an adult orphan, I must let go of the things that may have been meaningful to them, but perhaps not to me. I will try to place these items in appreciative homes, just as my parents would have wished. However, with the sublime comes the ridiculous in the form of a chest freezer that has not been plugged in for over twenty years. After some thoughtful planning I was able to move it with a crowbar and some furniture "skids", pushing it through the garage and onto the driveway for its eventual removal. 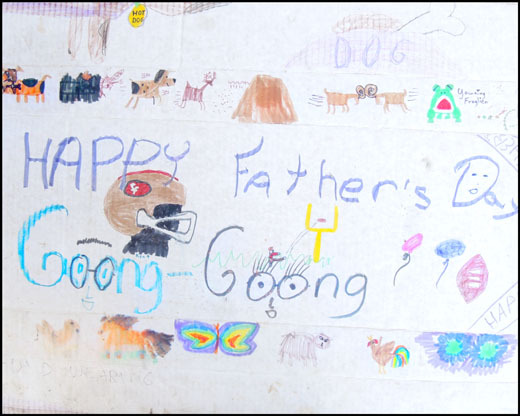 But when the top was cleared of assorted "stuff", I noticed that my mother covered it with some cardboard my niece and nephew used to make a "bigger than life" Father's Day card for "Goong-Goong", the phonetic spelling of the Cantonese word for "Grandfather". I thought about removing it from the freezer and keeping it, but decided that it was only the embodiment of a concept, the medium used by two children to show their love in the best way they knew. I know that my father saw it, allowing that love to flow from their two little hearts directly into his. It was a precious gift, one that he would carry forever. As children or as adults, we can never fully understand how important these gifts of love can be, or how long they will be cherished. Better than books, better than videos, my niece and nephew did far more than their young selves could understand, but after all these years, they will surely understand now. 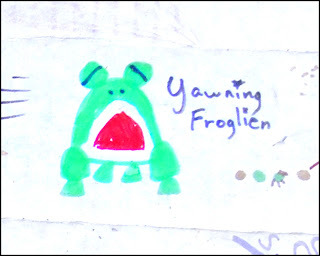 Perhaps I shall use the "Yawning Froglien" as my personal avatar. That seems fitting and proper.